Noel Dyson played the role of saintly Ida Barlow between 1960 and 1961. Born in Manchester in 1916, Dyson came from a wealthy family and after being educated in Sussex and Paris; she enrolled at London’s RADA and then performed in repertory companies across the country in places like Birmingham, Oxford and Windsor. After a hiatus during WWII, she returned to acting and made her TV debut in the BBC’s The Guinea Pig in 1948. During the 1950s she appeared in TV shows like Chance of a Lifetime (1950), The Vise (1957-1959) and Emergency Ward Ten (1959). In 1960, she was cast in the role of 44 year old Ida Barlow in new serial Coronation Street. She was married to postman Frank and mother to sons Ken and David. A placid character, Ida was forced to play referee between Frank and Ken who often clashed over class and ideals. A homemaker, she also worked as a cleaner at the Imperial Hotel. Debuting in the first episode, she rarely went to the Rovers and was close friends with next-door neighbour Albert Tatlock. Her mother Nancy Leathers came to live with the Barlow family when she fell ill. But the success of Coronation Street proved to be a problem for Dyson as she didn’t see herself in the programme for the long haul. When her contract came up for renewal, she refused to sign. Feeling that re-casting the role would prove unpopular, producers decided to kill Ida off – her being the first regular character to be killed off. Her death occurred off-screen with her being hit by a bus on the way home from visiting Albert’s daughter Beattie Pearson in September 1961. Overall, she appeared in 41 episodes. Due to her short time on the programme, Ida’s death didn’t have a huge effect and she’s been rarely referred to over the years, not even by her son Ken. 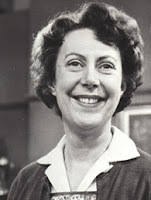 Dyson managed to secure several roles after her departure, but only supporting ones in productions for the BBC Sunday Night Play (1962-1963), ITV Play for the Week (1959-1964) and Thursday Theatre (1964-1965). In 1968, she was cast in the role of Nanny in sitcom Father, Dear Father alongside Patrick Cargill. She would play the role for the whole seven series until 1973 and in its sequel Father, Dear Father in Australia in 1978. In 1979, she secured another long running role as Aileen Potter in sitcom Potter, starring alongside former Corrie co-star Arthur Lowe who played her on-screen husband Redvers Potter. But when Lowe died, he was replaced by Robin Bailey in the third series before the show was discontinued. 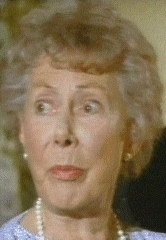 Dyson later appeared in hospital drama Casualty in 1993. She passed away in Cheltenham, Gloucestershire in 1995 aged 78 after collapsing on stage. She made a posthumous appearance that year in Heartbeat, a drama series based in the 1960s. She was married twice: to Kenneth Edwards and Harry Judge. Judge and Dyson were married until her death. Did you ever see or meet Noel Dyson? Do you have any pieces of trivia about her? Research from Wikipedia, Corriepedia, Corrie Net and IMDB. Aww, bless. She was lovely. I liked Ida. Its weird how Ken never has photos of his parents. Okay, they didn't appear long, she appeared under a year and Frank for about 4 years, but come on. It would be good continuity. I know Albert was more major in Ken's life in the programme from the 1960s to 1980s, but surely we can still have pictures of his mum and dad? "Due to her short time on the programme, Ida’s death didn’t have a huge effect"
Maybe not in the programme, but certainly for the viewers. Didn't they send wreaths to the Granada studios? And her funeral episode was the most watched episode at that point. Even so, a very interesting article. In fact they've all been very interesting, so thank you! Wedding for Liz McDonald in Coronation Street? Who does William Roache think he is? Sally Webster on the Olympics! Do you feel sorry for Dev - Yay or Nay? The new Ryan Connor - what do you think so far? Rob Donavon - what do you think of him so far? Who'll be the next Corrie serial killer? Is Michelle Keegan joining Strictly Come Dancing?